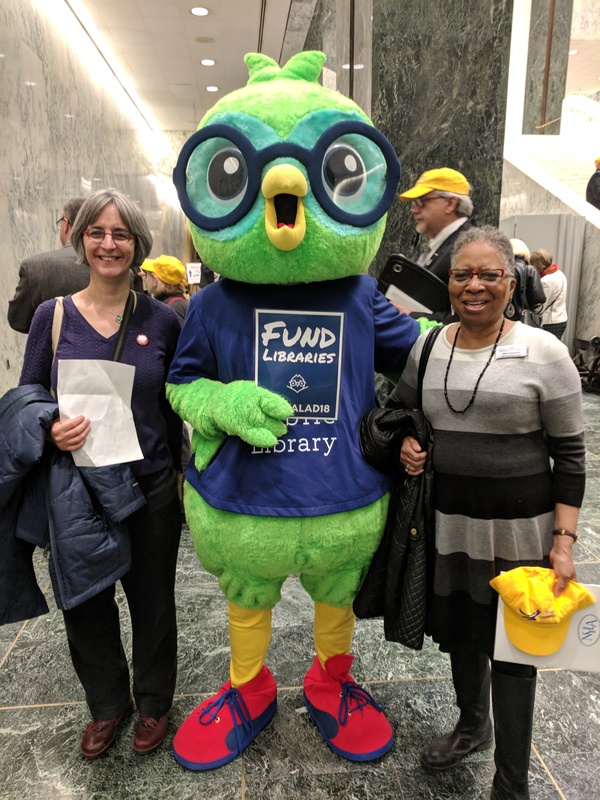 We had a great time meeting with other library advocates at the Capitol last Wednesday at #NYLALAD2018. If you haven’t written to your elected officials yet, there’s still time: Take action now! It only takes two minutes with New York Library Association- NYLA‘s Online Advocacy tool! The Friends of APL and APL Foundation collaborated on advocacy outreach leading up to NYLA Legislative Advocacy Day (#NYLALAD2018). The Friends tabled at the Washington Ave and Pine Hills Branches in February, telling patrons about NYLALAD, and also talking about Friends programs. On Legislative Advocacy Day, the Friends hosted a “Friends Zone.” Only 9 visitors came — but they came from all over New York State! From NYC, Rockland County, Montgomery County, and Erie County. In addition to serving coffee, Friends of APL members and Foundation volunteers tabled in the Washington Ave rear lobby all day on NYLALAD. 21 patrons sent emails to their elected officials using the NYLA Online Advocacy Tool, and left with an “I Love Libraries and I Vote” bumper sticker. Local library friends and patrons are a ‘sleeping giant’! With that in mind, the Friends and Foundation expect to do it again next year, with stronger outreach to other Capital District Friends groups. If you are a member of a local library Friends group, please contact the APL Foundation about having Foundation Director, Lex Bhagat, or a member of the Friends of APL come to speak with your group about teaming up on the Friends Zone next year!